A GENTLE GIANT HE WAS- Â battling sickness, he peacefully died in his sleep. But like the great generals, however, he did not really die- he just faded away. 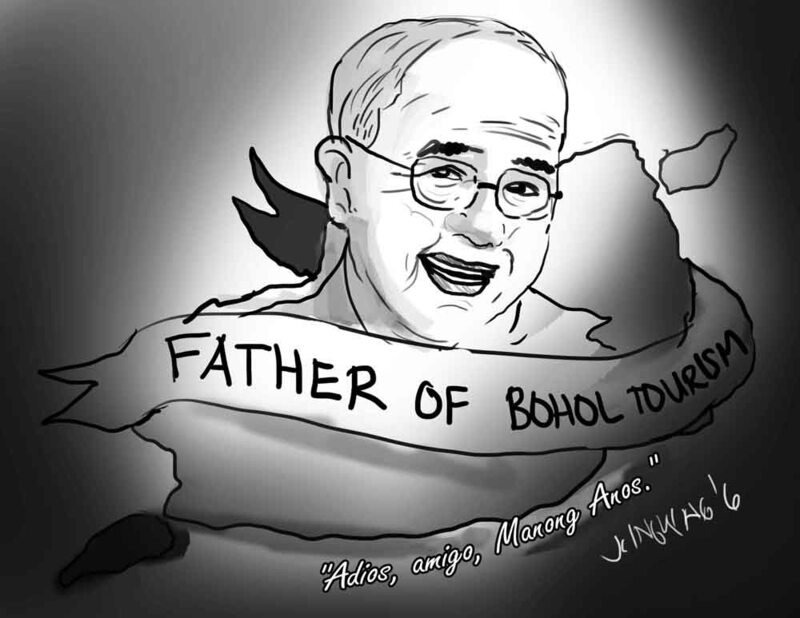 His name is Anos Fonacier, the “Father of Bohol Tourism” . Yet, he was not born Boholano, he was an Â Ilocano- born in Sarrat , Ilocos Norte ; yet he has more Boholano than most Boholanos. Though a well-traveled globetrotter,Bohol became his first home, loving every day that he spent here. If he left Bohol -it was with a promise that he will be back home. Because home is where your heart is. Only grievous medical attention in Manila yanked him out of Bohol for some time. We especially grieve his passing-for he was one of the best pals of the late founder of this paper.They shared two things in common – love for newspaper work and tourism. Dejaresco founded this 62 year old community newspaper; he was one of the founders of Sun Star (Cebu). Fonacier rode a helicopter and discovered Â that Panglao was a tourist heaven; Dejaresco scaled the Â top Chocolate hill that now hosts the iconic hills’ viewing deck, concluding that it was the highest peak among the thousand beauties. They were tall and short- but together they shared stories of laughter that reached the next house. For Nong Anos was a PR (public relations man) who made every man he met happier after than before they met.Â It was just the nature of the beast. Not all know that Fonacier was a lawyer and an Aglipayan -believer. But at the same time- Â he built the chapel of Our Lady of the Sacred Heart Parish in Capitol Cebu which had a special meaning for him.He was a model of Â modern day ecumenism. Dawn Roa, former regional director of the Department of Tourism knew the man since she was high school. “A visionary, he was, way ahead of his time”, Roa who is now a consultant for various government and private tourism institutions, declared. From a lowly tourist guide and with his own Saro jeepney based in the Manila hotel,this Ilocano (whose name means “patience”) used his lineage to hobnob with the likes of region mates Ferdinand Marcos, Jose Aspiras, Max Edralin and Max Soliven that Â helped push him at the forefront of his beloved industry- tourism. His investments were ground breaking strokes at the Â then frontiers of tourism- from the Bayview Hotel in Roxas Boulevard, Cebu Plaza Hotel (Marco Polo now), the Tambuli and the Argao resorts in Cebu and finally the beautiful Bohol Beach Club . His stroke of genius brought Bohol (starting with Panglao) into the world tourism mapIf for this alone, let each of us who benefit now Â from the fruits of tourism – say Â ( at least) a silent prayer for him who started it all. Even Cebu who had “Ceboom” do not fail to acknowledge the imposing presence of Anos Fonacier in this accolade. In the real world, Fonacier knew which buttons to press.The “Kalakbay Lifetime Achievement Award” in entrepreneurial tourism given by the economist -president Gloria Arroyo served notice to all how tall this Gentle Giant had grown in the industry. Anos F. was frugal- in the positive sense that he savored not wastage and put his money where the yields were at its optimum. A trait Ilocano indeed it was Â as much as it Â is Boholano. No wonder he loved it here. Sure, there were business “mistakes” he would commit Â -as every seasoned businessman – always meets along the way. But Fonacier moved out soon enough to avoid his financial collapse. His investments in the (world golfer hero-inspired ) Gary Palmer 18-hole golf club in Busay, Cebu and his prawn farm in Maribojoc are examples. But passion, boy , did Fonacier have passion, for tourism. He would not count his 15-hours-a day involvement in tourism as” work” as much as it was for him Â “play” , as he was truly having fun. He loved the cake and the icing of tourism. And as St Mother Teresa said” work, without love, is slavery.” A slave indeed, he was not. Fonacier was likewise Â a true disciple of media and propaganda. Perhaps, he believed that having a good product, affordable prices and accessibility are not enough. He pushed in a tremendous way- the fourth P in Marketing- Promotion. This he emphasized to all Bohol leaders. He was a propaganda expert of the highest caliber. Verily, the comprehensive Bohol Tourism Master Plan Â and the foundation of the concept of a Bohol international airport also Â have big footnotes of Anos’ wise inputs, so recalled Roa. Anos Fonacier is one of a kind- aÂ sui generis.Â He comes once Â in every century (he died at 90) Â and spent the best years of his life in Bohol.Â Many of us have become better men because of him. But like truly great men whose contribution to society is priceless- Fonacier remained self-effacing ( he was camera shy even)- mandating that his death not be marked by fanfare. No wakes, no long processions, no tears- just a quick cremation to join his Creator. Those who believe in the Buddhist concept of reincarnation will then Â have to await his return in another life. But in our lifetime- lucky is a weak word to describe Â all of us because he was with us. Mr Fonacier, by what grace of God did we ever deserve your presence here ?.Adios, amigo, Senyor Anos.